Packing the cars. Hotter than blazes already. Good, direct, garbage-free summary of everything in the PPACA. CaspianX2 comments on ELI5: What exactly is Obamacare and what did it change? Quickie run so I don't lose all my conditioning. (Resting and going light in the hope that muscle soreness improves.) 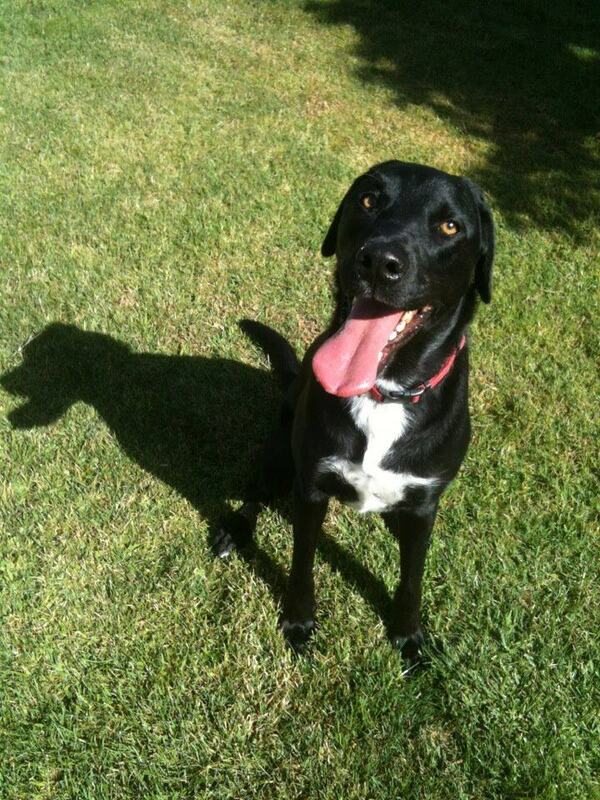 Divi very excited to go run since we haven't gone in a few days. 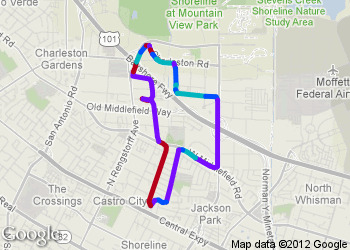 Finished Run with Runmeter, on 3.6 route, time 31:27, 3.53 miles, average 8:55 /mile, see http://j.mp/OqIdPE. Bed at 4am due to "just one more turn" in Endless Space campaign. Woke up with splitting sinus headache. Dosed ibuprofen and sudafed. Fed dogs, who need to learn to sleep late on weekends or feed themselves. Back to sleep. I hope. Blargh. I was just a witness to much the same in my house for the past nine hours. This is brilliant from start to finish. Don't forget to read the license. If you're not angry, you're not paying attention. I fear the loss of Mai Tais, and not enthused about it being seafood. Nice evening run. Still trying to get my form right. 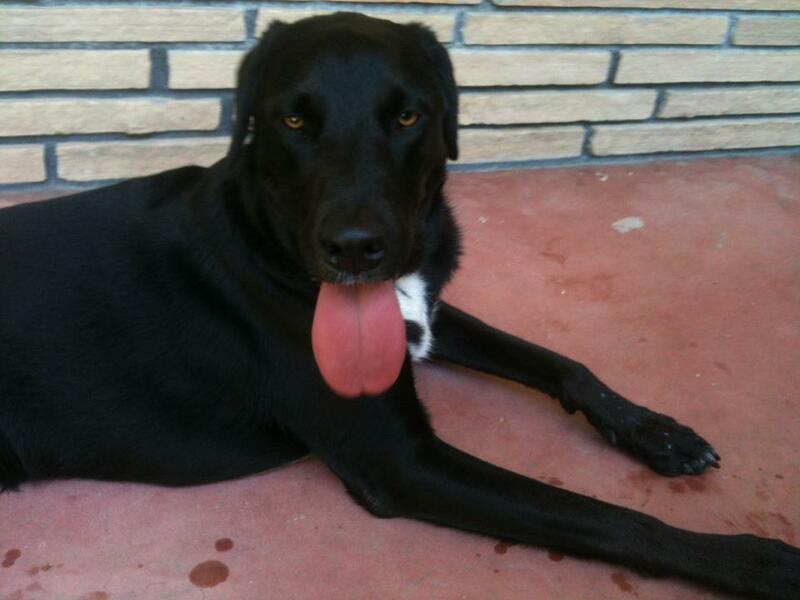 Divi very surprised and excited to go running! 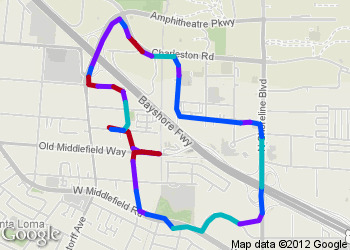 Finished Run with Runmeter, on 5 Rengstorf,movies,Rex Manor route, time 43:12, 4.91 miles, average 8:48 /mile, see http://j.mp/MmSfeF. "147 of your friends logged in since your last post" ... but we are only going to show you a tiny, random subset of what they posted. A bit late today. Need to find a 5 miler that uses the new pedestrian bridge. Finished Run with Runmeter, on a new route, time 40:39, 4.72 miles, average 8:36 /mile, see http://j.mp/LzlhZC. Out early to beat the heat. Still hot, but later it will be much worse. Checked out the new pedestrian bridge over 101 to see if it was open yet (it is). Crossed and ran an arbitrary route for a bit over 3 miles. 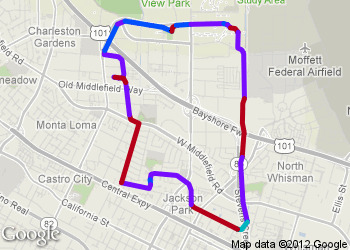 Finished Run with Runmeter, on random route, time 30:21, 3.34 miles, average 9:05 /mile, see http://j.mp/N5wZx7. Happy dog at our 3.5 mile water break. Meh run today. Was uncomfortable the first three miles. Smoothed out near the end, though. Finished Run with Runmeter, on 5 Rengstorf,movies,Rex Manor route, time 43:49, 4.96 miles, average 8:50 /mile, see http://j.mp/LGdef8. 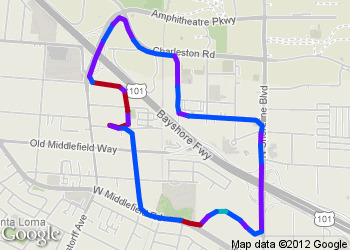 Finished Run with Runmeter, on 5 Rengstorf,movies,Rex Manor route, time 43:14, 5.01 miles, average 8:38 /mile, see http://j.mp/LZ0Rsa. Finished Run with Runmeter, on 6.9 Reng,creek Trail,moffet,rex route, time 59:10, 6.83 miles, average 8:40 /mile, see http://j.mp/LgrGXX. Stewardess? I'd like a double vodka with that medal, please. Here’s hoping that the 300 volunteers who will be medal bearers and bouquet presenters at the London 2012 Olympics look good in purple. Prometheus: just realized that they got Guy Ritchie to play the part of Weyland FOR THE FAKE TED VIDEO. 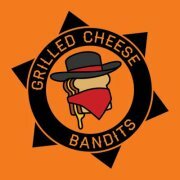 In the movie itself, the role could have been played by anyone. Iwan Axt and Brian Scott will be first in line on opening night. The title is perhaps a bit overstated. Humans throw very well too. Perhaps Long-Distance Bombardment would be the least absurd sport. Runmeter peeps: "If you've been having trouble posting from Runmeter today, this is why: Facebook is currently blocking links from the URL shortener that Runmeter uses." Jeez, Facebook, thanks for that. Prometheus. The first half was jaw-dropping. The second half not quite up to that standard, but still good. Spreading ignorance one child at a time. Imgur is used to share photos with social networks and online communities, and has the funniest pictures from all over the Internet. Short, fast run today. Checked on new pedestrian bridge across 101. It's not quite done yet, though it shouldn't be too much longer. 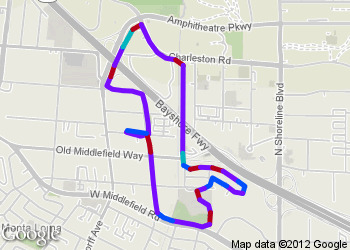 Finished Run with Runmeter, on 3.6 route, time 31:33, 3.80 miles, average 8:18 /mile, see http://j.mp/Lavdc8. How long until Google can read your pulse FROM SPACE? Elke, Jenn, Donna: I just saw a trailer for the Les Mis movie and I am confused at the lack of squee over the presence of Hugh Jackman. Please explain. There aren't many days nicer than this. Energetic and relaxing. Good breeze. Just perfect. 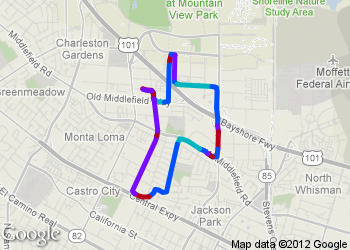 Finished Run with Runmeter, on 5 Rengstorf,movies,Rex Manor route, time 42:38, 4.98 miles, average 8:34 /mile, see http://j.mp/MnBQLY. Wolfram Alpha does do some very cool stuff. How about the weather on your birthday, where you were born? Wolfram Alpha does do some very cool stuff. Actually tired out the dog today! Casual, long run today before the heat rolls in. 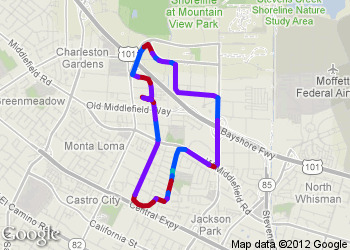 Finished Run with Runmeter, on 6.9 Reng,creek Trail,moffet,rex route, time 1:02:51, 6.94 miles, average 9:03 /mile, see http://j.mp/L3pgdz.